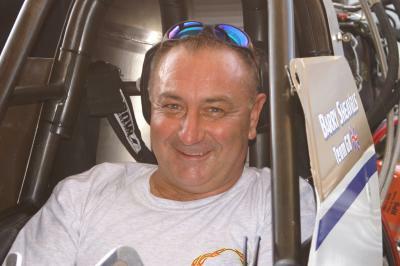 UK Top Fuel Dragster racer Barry Sheavills returns to the track at the 2007 Flame and Thunder Show at Santa Pod Raceway, where he is due to match race against Norwegian rising star Linda Thun Tønseth. Rick Cuthbert of Santa Pod Raceway caught up with Barry a few days before the Flame and Thunder Show to find out what he has been up to and what drives his enthusiasm for drag racing. Rick Cuthbert: Hi Barry, we've missed seeing you at the wheel of a Top Fuel Dragster, but have you been in any other race cars since your last ran in anger in the European Championships? Barry Sheavills: Yes! Of course I was running at the Flame and Thunder a few years back, but due to the very ropey weather we didn't really achieve any runs of any consequence. Then a year ago almost to the day, we were in Bahrain for the Drag Racing Festival, and we clocked a reasonable five second run in Rune's car. Rick Cuthbert: I remember you once telling me that you could never go back to racing anything slower than a Top Fueller- is this why we have had to wait so long to see you in action? Barry Sheavills: When you first asked me that, it was a long time ago! Now I'd consider driving anything. Rick Cuthbert: What achievements in your racing career have made you most happy? Barry Sheavills: Oh blimey. Obviously, winning the FIA Top Fuel championship in 1998 was the very pinnacle of my career, and running the first 300 mph in Europe was a goal I aimed for achieved, and that can't be taken away. We had the traditional Sheavills celebration that night as you can imagine! Rick Cuthbert: And what moments in your drag racing career have been the hardest? Barry Sheavills: Well, it wasn't actually the crash. It was trying to raise the money to go racing again afterwards. It is actually less depressing having a bad crash, than it is not racing. To race Top Fuel in Europe is a lot of money, and it's depressing working hard trying to find that sort of cash, and not achieving it. Rick Cuthbert: Low traction is always cited as a major problem at Flame and Thunder, but why, and what can you and your crew do to combat it and run the numbers? Barry Sheavills: As a driver, there is nothing you can do. The cars are set up in the pits, and they either go or they don't. If the car goes up in smoke, your job is to save the engine or the car if it goes out of shape. The difficulty with a modern Top Fuel car is that you are not supposed to put your foot back on the accelerator once you have taken your foot off. So what is tough (in conditions such as one would expect at the Flame and Thunder) is knowing how to pedal it without wrecking it! The team's job in the pits is actually to try and reduce the horsepower. The modern Top Fuel car will produce 7000 bhp, but the track can only take a given amount, sometimes as little as 3000 bhp and it's a difficult job taking that sort of power out. Another thing the crew will do is try to make the clutch slip as much as possible so the tyres don't slip. Having said all that, if the weather is as good as it was last weekend, we could make the car go seriously quick. The car will actually produce more horsepower in cold weather due to the dense air. It's all a very complicated balancing act, and the tuner has the difficult job in many respects, not the driver. Rick Cuthbert: What is your favourite race class to watch which isn't Top Fuel and why? Barry Sheavills: Pro Mod. The reason for that is I used to be a hot rodder, and these cars are static show winners as well as race cars that can run 200 mph! The drivers need to change gear on the run, and they have a short wheelbase with massive Top Methanol engines, all of this makes it a fantastic test of the driver. The best thing is of all is that the driver can chose what the car looks like, and none of the cars in the class are the same. It really is a fantastic class: great to watch… and it must be great to drive too. Rick Cuthbert: Which drivers or riders have you been cheering on in 2007? Barry Sheavills: Thomas Nataas. He was been instrumental in my getting a drive in Bahrain, and he says nice things about me, so I was cheering him on. However, in the back of my mind, I thought Urs Erbacher was going to win, and he did, so I was pleased for him also. But you cheer every driver on really, because you know what they are going through, and you want to see them go quickly and safely. Rick Cuthbert: What cars do you have in your garage at the moment, and are they for fun or just for doing a job? Barry Sheavills: Well, I would love to say I had a Harley and a Hot Rod, but having had the expense of being a Top Fuel driver for years, the garage is now empty of all things exciting. Rick Cuthbert: Do you think youthful reflexes or Top Fuel experience are going to win the day at Flame and Thunder? Barry Sheavills: Experience I hope, because I have no youthful reserves to fall back on! Rick Cuthbert: What have you been doing to prepare for the race? Do you need to get mentally or physically in tune to stand the best chance? Barry Sheavills: On 13th September I got the phone call asking me to drive, and from then until now, and from now until race day, I am not touching a drop of alcohol, and I have been following a good diet. It seems to have gone well so far. Mental fitness for drag racers is important and not drinking alcohol helps this. When I race, I don't drink. But when you are not racing, it's tempting to have a bit, so racing is actually good for your health because it keeps you off the bad food and drink. You have to respect the power of car you are driving, and do everything you can to be alert and healthy. Rick Cuthbert: Thanks Barry, we wish you all the best for the Flame and Thunder! Barry Sheavills: I'd like to thank Santa Pod Raceway for giving me the chance to drive again, and thanks in advance to Rune for letting me drive his car and to the team for doing all the hard work I know they are going to have to do. Feature ©Rick Cuthbert and Eurodragster.com.